Most ham manufacturers are willing to report that their hams contain no gluten ingredients, but they're not willing to state that their products necessarily meet the accepted definition of "gluten-free" (containing fewer than 20 parts per million of gluten). That's because ham isn't always safe on the gluten-free diet—spices and glazes can (and frequently do) contain gluten ingredients, and the meat itself can be subject to gluten cross-contamination in processing. If you're particularly sensitive to trace gluten, you may want to stick with one of those brands. Otherwise, lots of brands contain no gluten ingredients. Regardless of your sensitivity level, always read the ingredients on any ham you buy, since glaze packets often contain gluten (if in doubt, throw it out and make your own with the recipes using the list included below). There's also a chance that the ham itself will include a problematic ingredient. Also, keep in mind this list only applies to the United States; ham sold in other countries (even by the same company or brand name) can have different ingredients and different manufacturing procedures. Here's our list of U.S. ham manufacturers and their gluten-free status. A division of the John Morrell Food Group, Armour Meats sells more than a dozen different types of ham, ranging from deli-style ham to whole hams. A John Morrell spokesperson tells me that the company does not use ingredients with barley, rye or oats, but does use wheat in some products. The label will disclose if there are any wheat-based ingredients, she says. Shared lines may be a problem: even if a ham product appears gluten-free by ingredients, it may still be made on shared lines, she says, although the company follows cleaning protocols to minimize cross-contamination. Therefore, you should only use an Armour ham that does not include wheat-based ingredients on its label. Iowa-based Beeler's Pure Pork sells several different types of ham, including bone-in and boneless uncured varieties. Company spokesperson Julie Beeler says all Beeler products are made in a gluten-free facility with no gluten ingredients. The company prides itself on raising pigs naturally in an environment where they can socialize and have access to the outdoors, without antibiotics or growth hormones. Broadbent's, which is based in Kentucky (the home of excellent ham, as some would say), makes both "country" and "city" hams. However, a company rep tells me that Broadbent's doesn't test for gluten or make any sort of gluten-free claims. It does make some products that contain gluten. Butterball makes a lower-fat turkey ham that's usually sold in the deli section. The company's Frequently Asked Questions page states that only two Butterball products (one variety of meatballs and a frozen stuffed turkey) contain gluten. Therefore, you can assume that Butterball's turkey ham contains no gluten ingredients. However, the company doesn't test for trace gluten. Vermont-based Dakin Farm features both bone-in and boneless hams, some of which are spiral-sliced. It also sells ham steaks and chops. According to the company, which does label some products gluten-free, none of its hams are considered gluten-free. This is another division of the John Morrell Food Group. Like Armour hams, Eckrich hams will disclose any added wheat on the label although there may still be a risk of cross-contamination. The company does not use barley, rye or oats in its products. Farmer John, a division of Hormel, makes several different whole and half boneless hams. According to Hormel, the hams are not considered to be gluten-free. 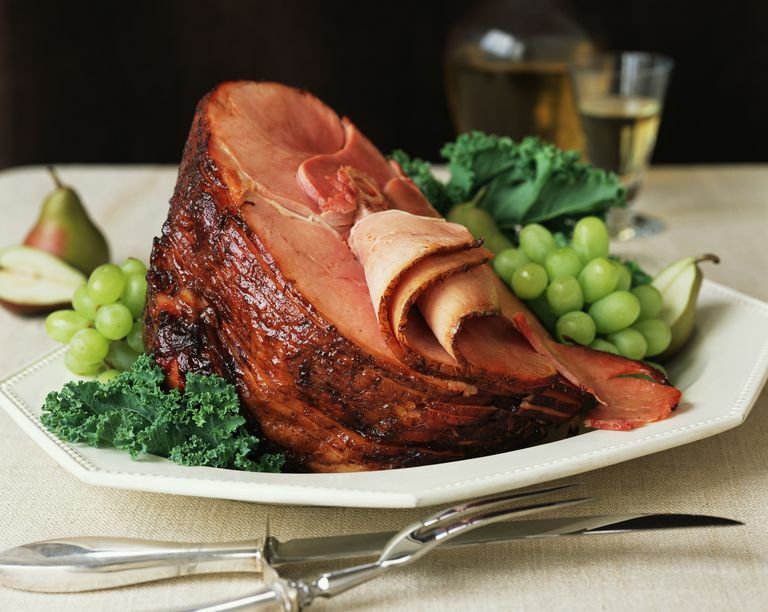 Gwaltney makes several different spiral sliced whole hams, including honey glazed and brown sugar flavors. According to the company, any gluten ingredients used in producing the hams will be called out by name (wheat, rye, barley or oats) on the product's label. Gwaltney does not test its hams for gluten or use dedicated gluten-free equipment. Hatfield's list of gluten-free products includes only one ham: Bourbon BBQ Ham Steak. This may be manufactured on the same lines as gluten-containing products (although the lines are cleaned thoroughly in between product runs), according to a company representative. Since Hatfield also makes numerous products that contain gluten, I advise caution with this ham. In addition, some people react to bourbon, which is distilled from wheat and barley. Hillshire Farm, a division of Hillshire Brands (which also owns Ball Park franks, Sara Lee cakes, and Jimmy Dean sausages), sells several different kinds of smoked ham. Right now, Hillshire Brands only labels a small handful of products as gluten-free (none of them are from Hillshire Farm). "We do not promote or certify that any of our other products are gluten-free currently, as we do not test for gluten," says a company representative. However, Hillshire Brands is in the process of determining which of its products would qualify as gluten-free and should be coming out with more labeling in the future. This company produces mail-order hams and turkey breasts that it ships throughout the U.S. The company does have a list of gluten-free list of products, but the hams do not appear on it. This chain of franchise ham shops reformulated its glaze years ago to make it gluten-free. HoneyBaked Ham states that its Signature meats—HoneyBaked Ham, Sliced & Glazed Turkey and Boneless Ham—all are considered gluten-free. However, be warned that many people have reported reactions to these products in the past. Regardless of whether the culprit is the glaze (double-check the glaze ingredients—people have reported finding "wheat" listed even though the ham is supposed to be gluten-free), cross-contamination of the ingredients, or problems at the individual franchises, tread carefully when purchasing HoneyBaked Ham. Some people have had success when asking an individual store to make the ham for them without the glaze, but be aware that there still could be cross-contamination issues with this approach. Always check the label, as ingredients can change. Look for the prominent "gluten-free" designation on the ham packaging to be certain the product you're purchasing is safe. Nodine's makes "artisanal hams," with the options of bone-in, boneless, apple-smoked, spiral cut, and ham steaks. Varieties vary by season. These hams are considered free of gluten ingredients and are naturally smoked. Two Nodine's products (Irish and English bangers) do contain gluten. A customer service representative says the company will clearly identify gluten ingredients on labels, so always double-check the label of a product prior to purchasing. In addition, Smithfield has been working to eliminate their use of gluten and other allergens in its products, and most of its processing plants are now gluten-free. In cases where cross-contamination is a concern, Smithfield utilizes a program that includes full equipment washdowns and a change of personal protective equipment, with documented verification between allergenic and non-allergenic ingredients. You probably don't think of ham as a processed food (processed foods have a higher risk of gluten cross-contamination). But ham is more likely to have gluten ingredients or to have been cross-contaminated with gluten than a fresh pork loin, for example. If you have a brand of ham you like and you haven't experienced a reaction, then stick with that. But if you're new to the gluten-free diet and you're searching for the safest ham possible, your best bet is to choose one that's certified gluten-free, such as Dietz & Watson and Jones Dairy Farm.